Donate – Francis Small Heritage Trust, Inc. Donations are very much appreciated. The Trust has no paid staff and no rented office space, so most of the money that the Trust receives is used for direct program expenses. In general, less than four percent of the Trust’s gross receipts are spent on fundraising and overhead expenses. Several parcels still have monthly mortgage expenses, and we look forward to the day when the protection of those properties is complete. Your gift also lets donor foundations know that the Trust has local support, which can lead to future grants. The Francis Small Heritage Trust has qualified as required by 009 MRS, Chapter 385 and is licensed as a charitable organization (License # CO1163). The Francis Small Heritage Trust is classified as a 501(C)(3) organization by the I.R.S. so that your donation is tax-deductible. Please check with your accountant if you have tax questions. Donate online or use the printed form below with a mailed check. 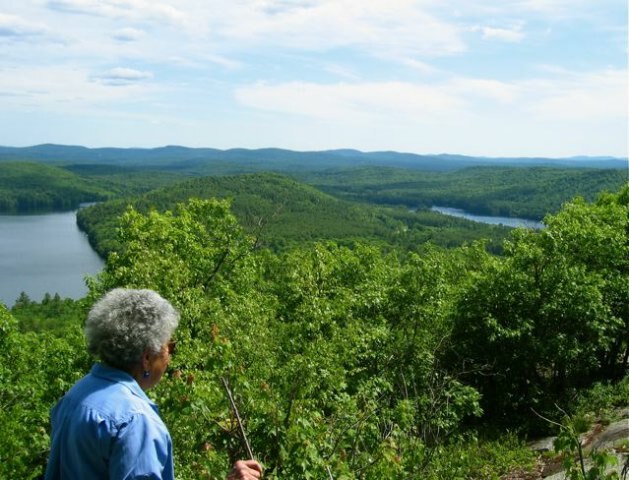 Janice Campbell admires the view from Bald Ledge.